365 Days of Defiance, Day 237: Yipes! Stripes! Sometimes defiance is simply refusing to do what "The Man' tells you to, and to heck with the consequences. 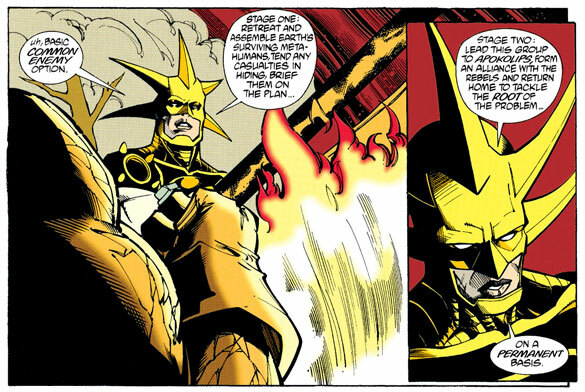 Also in JLA #41, source of yesterday's big Aztek moment  that's a big moment for Aztek, not a moment when Aztek suddenly became giant, like Apache Chief. But wouldn't that have been cool? 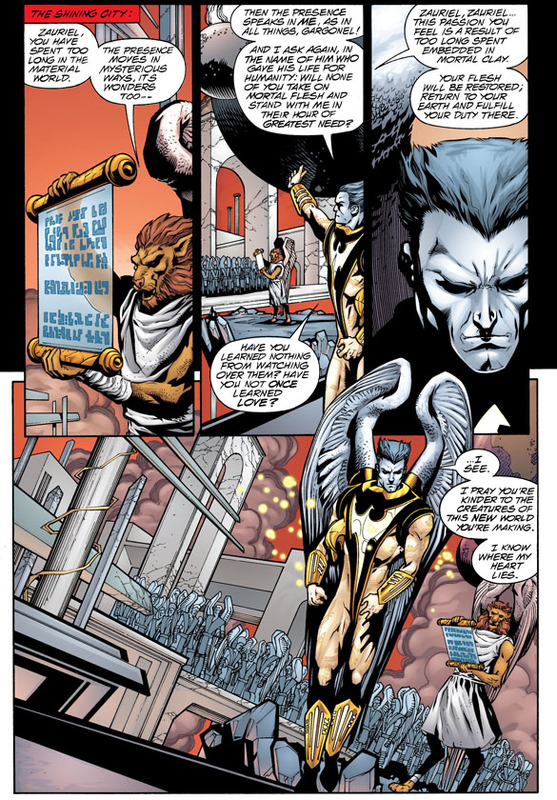 Anyway, here's where Hawkman Zuriel actually convinces the angels of the Shining City to stand with him and defend Earth from Mageddon. Hey, how'd he get back to Heaven to do this? 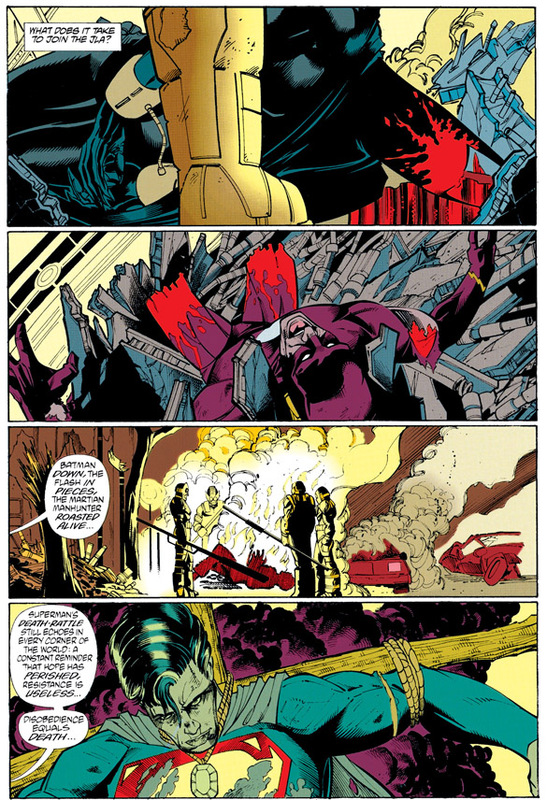 He let himself die in the previous issue. Now that's commitment. 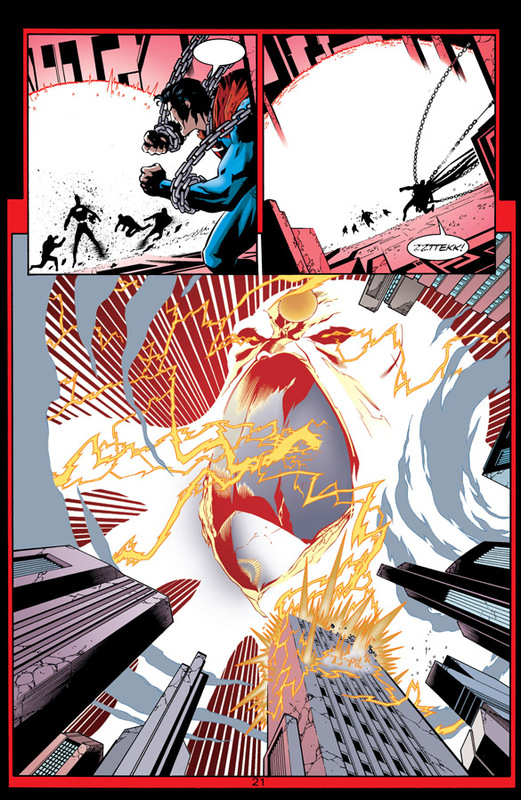 How awesome is JLA #41? 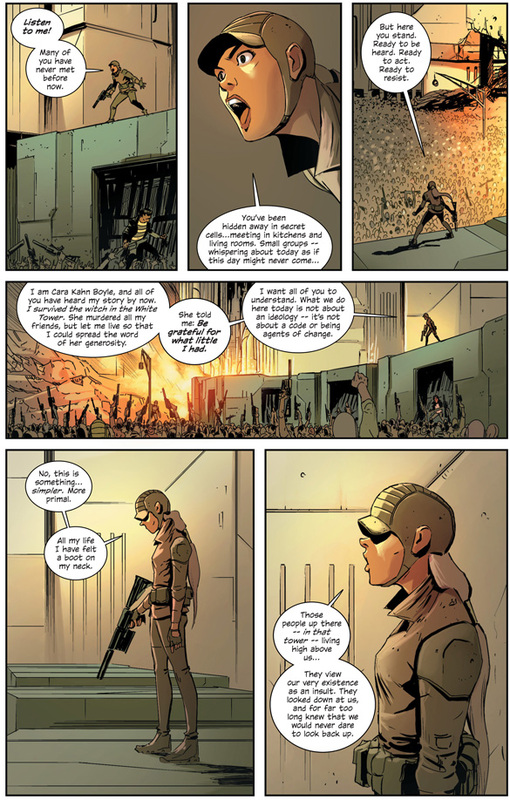 So awesome that there's even another great scene of defiance in it. Yeah, you know the one I mean. It's so epic, I'm gonna save it until December. Don't forget to come back then and every day in between because I'm really trying to catch up, honest. 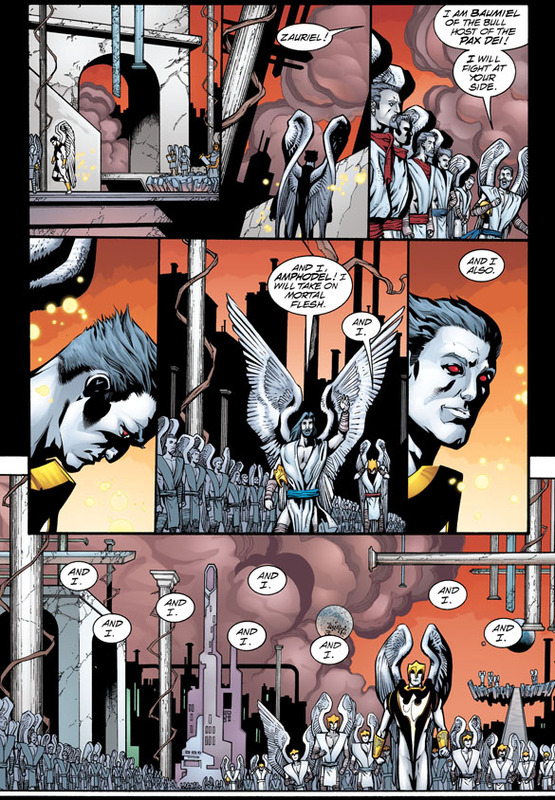 Yesterday I mentioned that Aztek's initiation into the JLA paralleled that classic ancient fable of the Kobayashi Maru, an unwinnable tactical situation in which we learn that how we face death is at least as important as how we face life. And with considerably more adrenaline! If Aztek's first day in the Justice League was the beginning of Star Trek II, then this issue of JLA is the climax of that movie, with considerably more superheroing and less "KHAAAAAAAAAAAAAAAAAAAAAAN"ing. Oh Aztek my Aztek, you were too good for this world  which you saved. 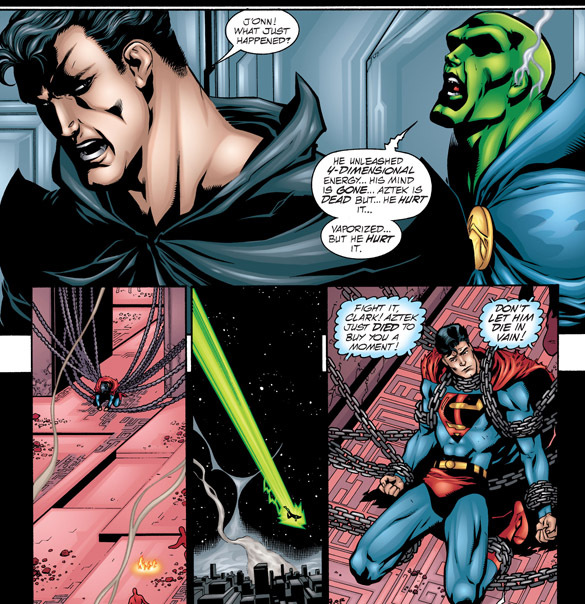 Thanks to the wonder of Grant Morrison, JLA #41 is actually chock-full o' moments of ultimate defiance. We'll look at another great one tomorrow. Oh no! 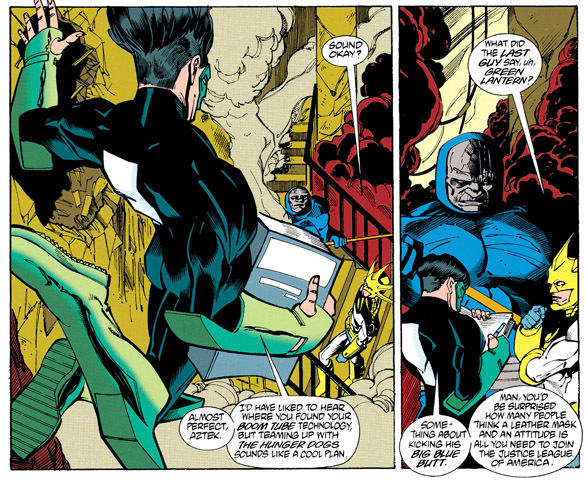 (he said, excitedly, because it's a Grant Morrison story and virtually anything could happen) The Justice League has been destroyed! By Darkseid! He's always pullin' that! Also, he's burning the American flag, so expect a stern rebuke from the right. Surprise! 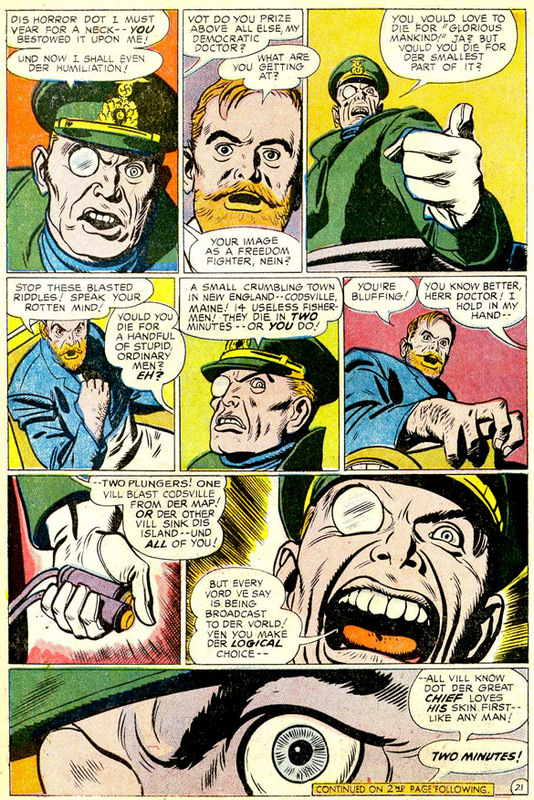 It's all a Danger Room-style simulation overseen by the tactical master of the JLA (hold on, gotta turn my head and laugh a little)...Green Lantern. The Kyle Rayner version, with crab mask and all! Turns out this was part of the initiation test to join the Justice League (A), and Aztek's tactical plan has passed with flying colors. Other parts of the initiation test not shown here include tugging on Superman's cape, taking one punch from Batman, and going to all-you-can-eat night at Golden Corral with Wally. 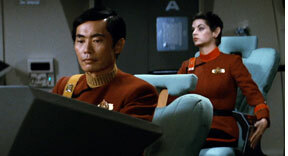 The test is, in fact, a Kobayashi Maru of sorts. 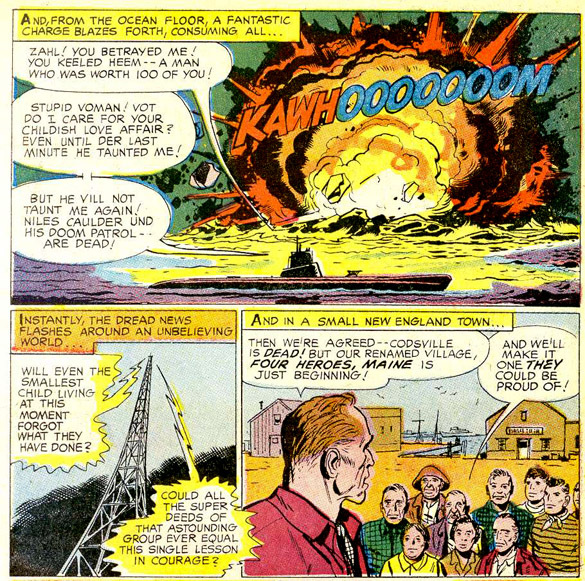 Unlike the real Starfleet thing, it is winnable  not by reprogramming the simulation, but by sheer force of the fact that nobody ever really dies in superhero comic books. These rules may not apply in dreams, imaginary stories (aren't they all?) 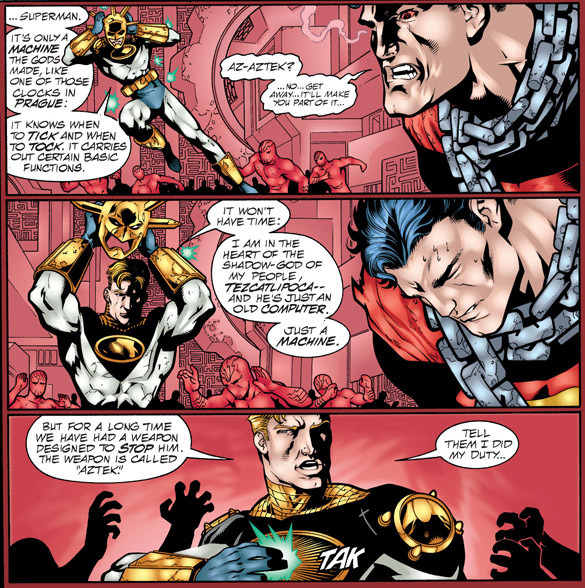 or Elseworlds, but that's not because of the power of Aztek's conviction but rather of Warner Brothers merchandising. Just as in Star Trek II, just like James T. Kirk with the glasses and all, this chapter of Aztek's short but illustrious career opens with a Kobayashi Maru test and ends not to soon after with him having to face the real deal. Join us tomorrow to see how we face death is at least as important as how we face life, Aztek. Well, what did you THINK the Doom Patrol was going to say? They choose death to save the people of Codsville. So how do you think they're going to escape this deathtrap? There's a lot of heroes in comics who have sacrificed themselves to save humanity  The Flash, Phoenix, Ultimate Spider-Man, even Superman...but I think the Doom Patrol were the first. And remember this: it was during an age where the revolving doors had not yet been installed on the afterlife, where dead pretty much meant dead. 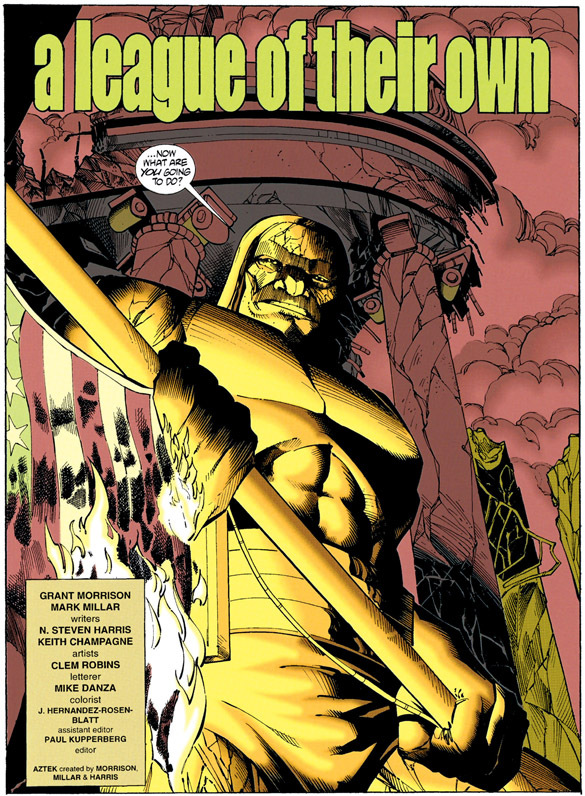 Sure, DC could have revealed the next month that the Doom Patrol had burrowed themselves to safety, or used time travel, or clones, or robots (well, aside from Robotman)...any number of quick escape tricks that comics would turn into cliches for still being alive or returning from the dead. But they didn't. 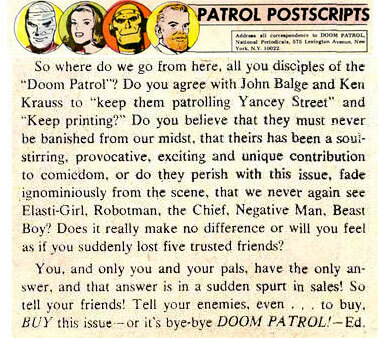 Dead meant dead in that, and the Doom Patrol was really dead. Their ultimate act of defiance became the greatest sacrifice of all. I shouted out, "Who killed the Doom Patrol?" J'accuse! 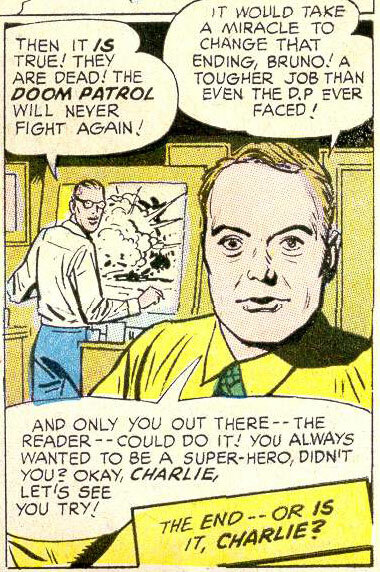 says Doom Patrol creator and destroyer Arnold Drake directly at us, beating Buddy Baker to that trick by 22 years. 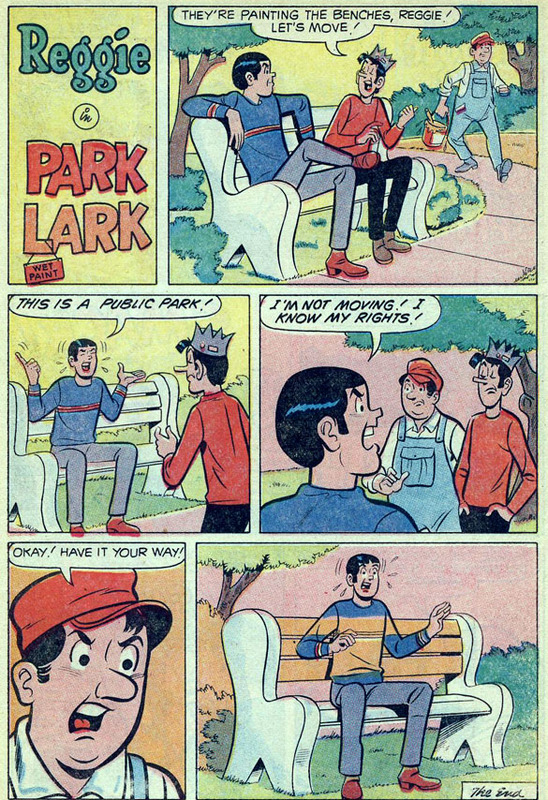 I'mma gonna assume that in the background artist Bruno Premiani isn't quite as accusatory of you and me, or, at least, those of us who are named Charlie. 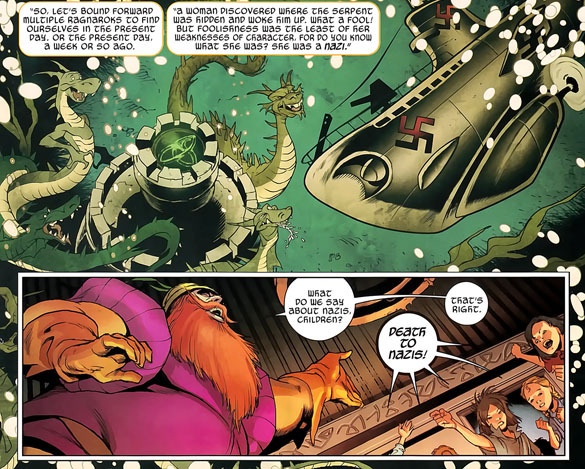 It's kind of late to be blaming us for not buying the book, but that's the general tone of DC's final column in this final ish of Doom Patrol. 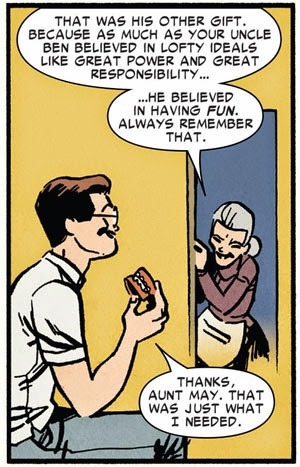 The snarky last panel and this editorial kind of haunt the otherwise pitch-perfect ending of the team; DC of the period frequently took that tone with its readers, which I imagine is one of the reasons the friendly, cheerful, buddy-tones of Stan Lee were more popular during this period. In the end, like every comic book hero except Bucky Barnes and Uncle Ben, the Doom Patrol "got better." 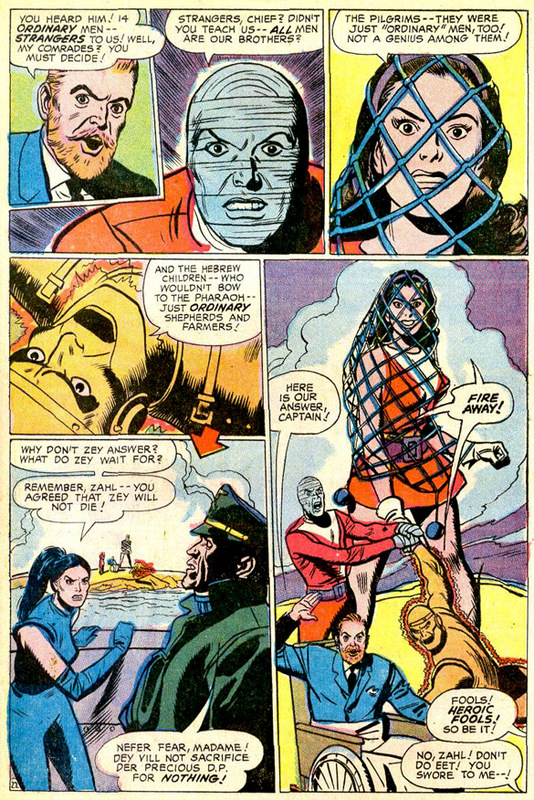 Robotman was back when an all-new Doom Patrol premiered in the pages of Showcase '77, Negative Man returned after a stint of being replaced with a Negative Woman (no MRA jokes, guys), and the Chief just rolled along back to have his beard hunted (again, actual canon!). 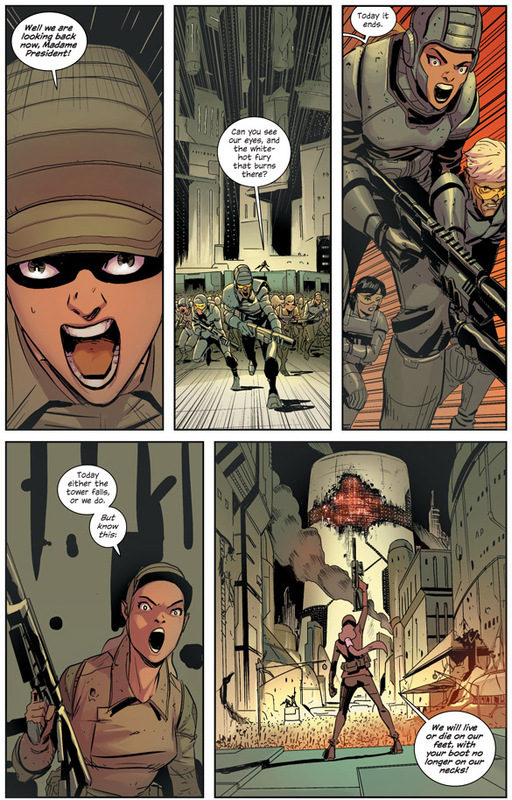 Even Elasti-Girl showed up once more in the movie The Incredibles a John Byrne series that existed mainly to wipe out the world of Grant Morrison. But for a moment, in their final moment of defiance, these four heroes gave up their lives without hesitation to save not even the world, but fourteen people they never knew. And the world wept for them, and honored them. We salute you: Niles Caulder, Rita Farr, Larry Trainor, Cliff Steele: the Doom Patrol.